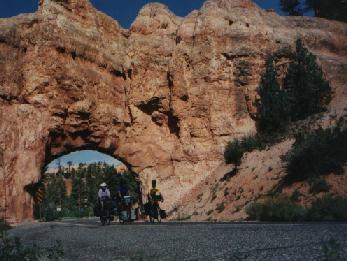 After a breakfast in the restaurant attached to the motel/campground, we were ready for the climb to Bryce Canyon. It was a beautiful day. Did I mention how blessed we were with 'beautiful days'? I was starting to take it for granted that the weather was always wonderful. How quickly we become spoiled! It was but a short jaunt down to the intersection with Rt. 12. Since it was mostly downhill, it was a pleasant start to the day and allowed me to limber up my legs before turning east and preparing to climb once again. There is a small village of restaurants, gas stations, motels, and convenience stores along this lower stretch of road. As I was making my way through this mini-commercial strip, I noticed a lone cyclist on the other side of the road who had stopped on the shoulder and seemed to be staring at a vacant lot on my side. Curious, I couldn't help but stop and ask her what she was looking at. "The prairie dog colony", she said matter-of-factly. It took some effort for your not-so-sharp-eyed narrator to finally spot them, but I eventually did. The cyclist who had caught my attention then went on to explain that the previous year she had done some kind of field study of this particular prairie dog colony. 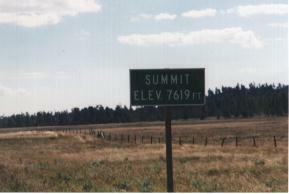 By the time we topped out on the plateau, I was definitely feeling the altitude. I could never quite catch my breathe. While we had been cycling through desert this morning, it now looked like we had somehow arrived in Montana. Evergreen forests bordered green range-land where herds of cattle grazed. A good strong tailwind helped me cruise along the plateau, still gaining altitude slightly, at an easy 20 mph. Finally we made our last turn to the south and started our final approach, now directly into the wind and still climbing, towards the entrance to the park. This was really slow going for me, as I was sucking for air with every pedal stroke. 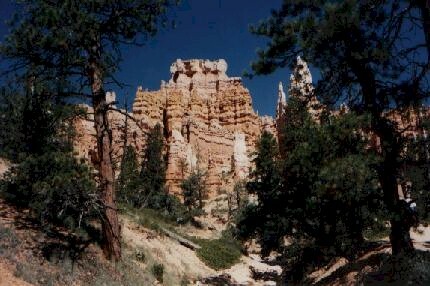 Around 2:00 PM I pulled up to the entrance to Bryce Canyon National Park. The ranger at the entrance station told me that the campgrounds usually fill up by 3:00, so our first order of business was to go and get a campsite. 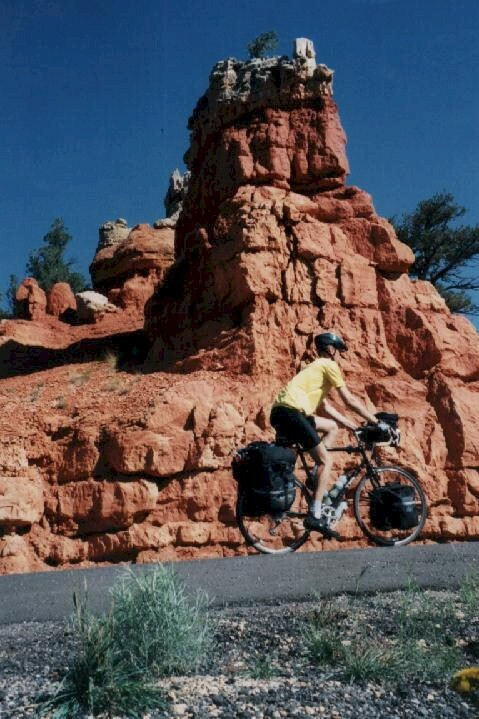 The campground host seemed to have a good idea of what cyclists want in a campsite, and he suggested a beautiful one. We didn't do much more than take a short walk out to the rim of the Canyon on Friday night. On Saturday most of us were up before the sun, so we could watch the sun rise from the appropriately named Sunrise Point. What a way to start the day! Being good cyclists, from here we proceeded directly to the all-you-can-eat breakfast buffet over at the Lodge. By the time we left the Park on Monday morning, the wait staff recognized us on sight, and probably issued special instructions to the kitchen to start making more French Toast to keep Rich contented and quiet. After doing what damage we could to the breakfast buffet, we spent a good portion of the day on Saturday on a hike down into the Canyon. Incredible! We walked among the multi-hued rocks; deep green evergreens growing out of cracks in the rock and along the occasional stream bottom; a deep, deep, flawlessly blue sky framing it all. 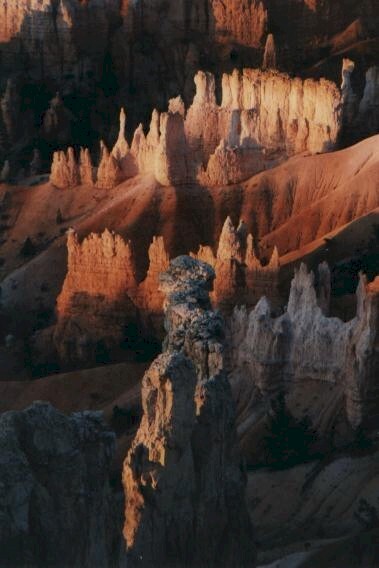 Did I mention how beautiful this part of Utah is? On Sunday Rich and I decided we just had to find a way to see the sights along the 18 miles of road that climbed through the canyon. There are no shuttle buses in the park, so our only choice was to ride. We climbed through 14 miles of fresh chip-seal, and a bit over 1000' of elevation gain, to reach Rainbow Point. Was it tough? You bet! Was it worth it? You bet! We returned in the afternoon to find a message from Freda that she had had enough of mountain climbing for this vacation, and was headed back to St. George to await our return. 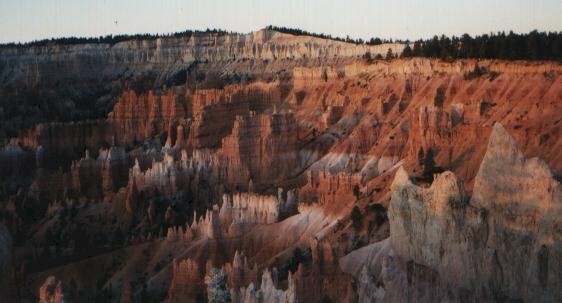 Our next phase of the trip would be to descend out of Zion, then climb all the way to 10,000 feet at Cedar Breaks. Freda apparently decided this wasn't for her.